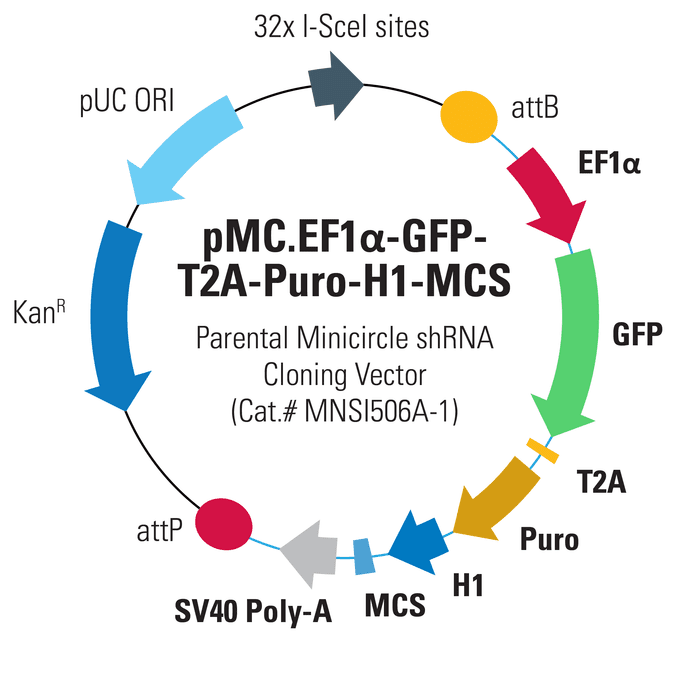 Deliver shRNAs to cells with minicircles produced from the pMC.EF1α-GFP-T2A-Puro-H1-MCS Parental Minicircle shRNA Cloning Vector and get all the advantages of Minicircle Technology. With your shRNA driven by the strong H1 shRNA promoter and both GFP and puromycin resistance for selection of transfectants, you can deliver your shRNA-of-interest episomally on an efficiently-transfected plasmid that is free of foreign DNA. The pMC.EF1α-GFP-T2A-Puro-H1-MCS Parental Minicircle shRNA Cloning Vector co-expresses the GFP and puromycin resistance selection markers via the moderate EF1α promoter. The Minicircle Producer Strain harbors an arabinose-inducible system to express the PhiC31 integrase and the I-SceI endonuclease simultaneously. The ZYCY10P3S2T strain also contains a robust arabinose transporter LacY A177C gene. Adding arabinose to the media turns on expression of the PhiC31 integrase and endonuclease genes, resulting in separation of the Parental Minicircle Plasmid into the individual minicircle and parental plasmids (from the PhiC31 Integrase activity), and the degradation of the parental plasmid (from Sce-1 endonuclease activity). Figure 1. Easy, sustained transfection in most cell types. Transfection of 1 μg of minicircle DNA (pMC.CMV-MCS-EF1-GFPSV40PolyA, Cat.# MN511A-1) into HEK293 cells delivers over one week of robust gene expression. Figure 2. Express transgenes for weeks in animal models. (A) Hydrodynamic tail vein injection of 2 µg and 4 µg of minicircle DNA (CMV-GFP-Luc) into mice shows excellent expression after 48 hours. (B) Minicircle-delivered transgenes retain robust expression that can last for weeks compared to transgenes that are delivered using plasmid DNA, where expression is rapidly lost. In this study, 40 µg of minicircle DNA was introduced into mice via hydrodynamic tail vein injection.